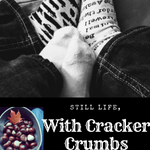 Saturday Snapshot | Still Life, With Cracker Crumbs..
From earlier this winter – I stumbled across it today, and I still love it so much. We had his cousin’s first birthday today, where we ate real cupcakes, and we gave her a tea set of her own. One that is pink and plays music, and is so adorable. I feel that there are many more tea parties in my son’s future! Saturday Snapshot is a weekly meme hosted by West Metro Mommy Reads. Great shot! Adorable, and one of those moments you just have to share. Thanks! He loves playing with his kitchen and kitchen toys. Elmo is a good playmate when I am busy. Lol. I love having tea parties with my granddaughter! I hope she never gets too old for them.